Firming Eye Lotion Reviews: Does It Work? Supporting the condition of the eye is one that is desired on a daily basis by so many women in the globe. The desire may be achieved based on the available creams and lotions already formulated. Nonetheless, there are numerous formulations which may not be supporting the body as they claim hence there is a need to be very careful while making a selection on a method to support the skin. This is a review on Firming Eye Lotion. What is Firming Eye Lotion? Firming Eye Lotion is a naturally formulated lotion which is meant to enhance the condition of the eyes, especially at the eye contours. It is enriched in a manner that it is capable of boosting the condition of the skin with no side effects at all. Moreover, this lotion may enhance the beauty of the face of the users through better radiance and suppleness. It may be contributing to better strengthening of the skin naturally hence revitalizing and renewing the condition of the eyes. Who is the Manufacturer of Firming Eye Lotion? The manufacturer of the lotion is known as La Mav. This is a company which is enhancing the lives of most women by boosting the condition of their eyes especially by supporting the health of the skin. The company is working with naturally beneficial ingredients which have long history in support of the condition of the skin in the body naturally. How Does Firming Eye Lotion Work? Firming of the eyes is better supported by the use of this lotion in the skin. The lotion is enriched with the necessary ingredients which have the potential to give a boost in the realization of better skin condition. It is penetrating the skin and offering the desired support all the way from the roots of the skin layers. In so doing, the developing of the skin layers follows better health foundation thus the user attains natural and improved condition of the skin. Firming Eye Lotion Ingredients – Are they Safe and Effective? Chlorella Vulgaris Extract – This is having beneficial amino groups for enhancing the restructuring of the skin in the body. Aloe Barbadensis – This is leaf juice extract from aloe plant which boosts the skin health making the eye regions look better. Macadamia Seed Oil – Supports better lubrication of the eye regions of the body . Coffea Arabica – May further enhance the attainment of better skin condition and support activity in the skin areas near the eyes. 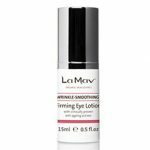 What are the Advantages of Firming Eye Lotion? There may be visibly lifted and well-toned skin in the body of those relying on the lotion on regular basis. The delicate eye areas of the skin might get a better boost with the use of this natural lotion. Appearance of fine lines and wrinkles on the skin of the users may be reduced. Under eye puffiness as well as dark circles in the eye regions could be eliminated from the face while applying this serum. What are the Disadvantages of Firming Eye Lotion? The website of the brand has listed too many ingredients hence not easy to determine the source of irritation to the body. Irritation in the eye areas may be noted especially when the content spill into the eyeballs. Using the lotion may need the user to have regular usage for a very long time in order to notice the improvement. Not all claims stated by the manufacturer of the formula may be attainable. How Should You Use this Firming Eye Lotion? Thin layer of the lotion should be applied on the contour of the eye. The application should be done twice per day and patted gently until fully absorbed. How Much Does Firming Eye Lotion Cost? The price is stated in the official website of the brand as $39.95. This is not including the shipping cost of the lotion. What is Firming Eye Lotion Return Policy? The manufacturer has offered a return policy on all La Mav products. The product shall be returned within 14 days of the product receipt. 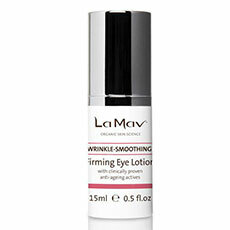 Does Firming Eye Lotion Offer a Free Trial? There is no mention of free trial on the lotion. One may have to pay for it in order to benefit from its usage in the body. The lotion is making a number of claims in enhancing the condition of the skin around the eyes. It is claiming to be having natural ingredients which are safe for the skin and are giving but only the benefits which the skin around the eyes need. One may also be getting reduced wrinkles and fine line while using this natural formulation. On the other hand, there may be a need for regular use of the lotion in the body to gain enhanced support. Irritation of the eyes following spillage in the eyes may also be daunting to the users hence the need to consider the possibility of support from other top-rated eye creams available on the market.